Flood alerts have been issued for large swathes of Scotland, with some parts bracing themselves for five days’ worth of rain in the space of 24 hours. 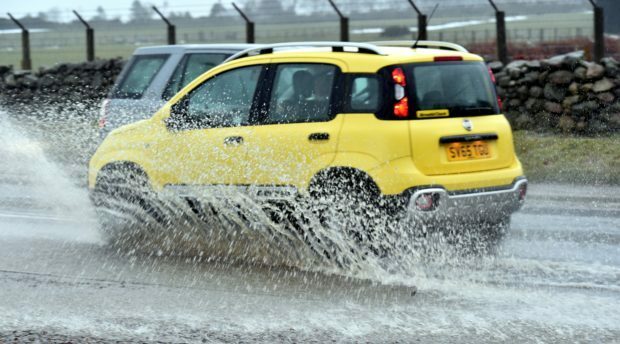 The Met Office has issued a weather warning for the west coast, stretching as far north as Ullapool and as far east as Ballater in Aberdeenshire. And the Scottish Environment Protection Agency (Sepa) has told communities across the region to prepare for flooding. Rain is expected to start falling this morning and continue well into tomorrow, with a warning in place from 9am today until 3pm tomorrow. While Scotland typically experiences 12mm of rain on a wet day, the Met Office is forecasting that most areas will have between 20-30mm falling over the course of today. Combined with melting snow, higher parts of the country could have the equivalent of 60mm of rainfall by tomorrow. Met Office meteorologist Craig Snell said: “For the Highlands, Moray and parts of Aberdeenshire, it is going to be raining for most of the day. Strong winds from southern Scotland are expected to batter the region at the same time. While not strong enough to warrant a weather warning, the Met Office says gusts of up to 50mph could be experienced near Fort William. These are also likely to cause some localised flooding in Orkney and Shetland, with high waves forecast to spill over coastal walls. Flood alerts are in place across all of western Scotland, including Wester Ross, stretching as far as Elgin. A Sepa spokesman said: “Localised flooding of low-lying land, roads and properties could occur due to high river levels. Motorists are being urged to take care on the roads if they are travelling today.